Phosphorus Starts With Pee In This Tale Of Scientific Serendipity : Shots - Health News German alchemist Hennig Brand started with about 1,500 gallons of urine in his 17th century hunt for gold. Discovering phosphorus was just a nice surprise. Know a modern tale of scientific luck? 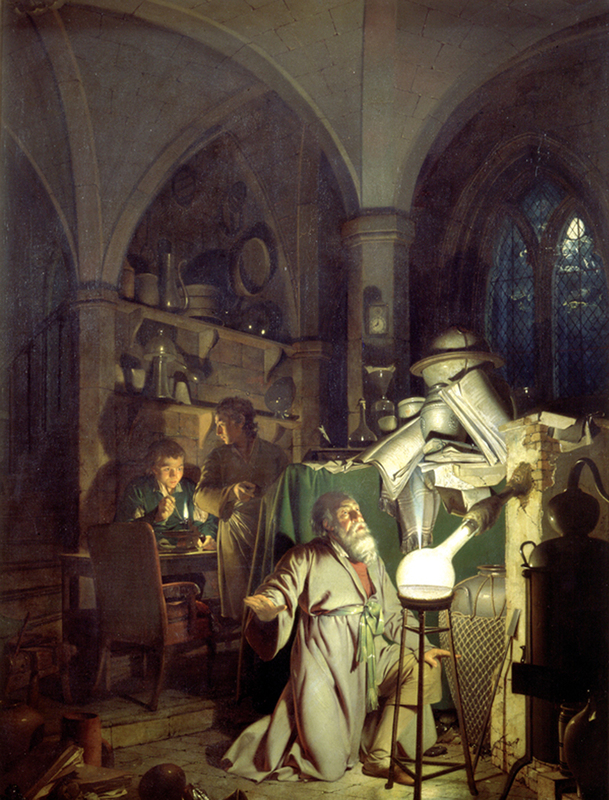 Alchemist Hennig Brand looks focused, if maybe a bit drained, in this 1795 painting by Joseph Wright. 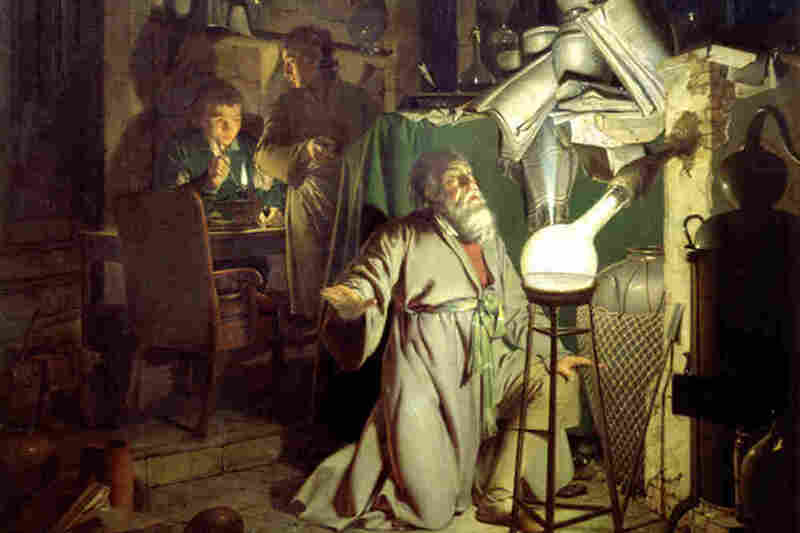 The painting depicts Brand's discovery of the chemical element phosphorus. The history of science is full of happy accidents — most folks have heard that penicillin was discovered in 1928, when a few mold spores landed on some neglected petri dishes in a London lab. But sometimes serendipity's role is a bit less ... mainstream. Hennig Brand was a German alchemist in the 1660s. I'm not saying he was a gold digger — but he did marry first one rich lady, and then, after her death, a second rich lady. And he used their money to literally try to make gold. Back then, a lot of people thought you could change worthless materials into precious metals. And Brand was convinced he could distill gold from a golden substance that he encountered every day: human urine. He used his wife's money to build a basement laboratory and employed his stepson as a lab assistant. Then, he started collecting. Take a good large Quantity of New-made Urine of Beer-drinkers and evaporate it gently to the consistency of honey. I'll spare you the rest — it involved lots of boiling and cooking and waiting. In the end, Brand's persistence paid off. He didn't make gold, but he did end up with a white, waxy substance that glowed in the dark. He had stumbled upon the element phosphorus. The name, appropriately, starts with "p."
Phosphorus, it turns out, is an incredibly powerful element. It has been used in deadly explosives and in the synthetic fertilizers that help feed the world. Throughout history, curious minds have turned mistakes, coincidences and surprises like the discovery of phosphorus into important scientific insights. Now NPR's science blog Skunk Bear is looking for modern examples — we'd like you to send us your stories of happy accidents in the lab and in the field that led to interesting discoveries. Or maybe such stories from your friends or professors or students or colleagues — or just modern cases of scientific luck you've heard about. Our favorite stories will be honored in an awards show later this month, and one twice-lucky scientist will receive a trophy from Skunk Bear — The Golden Mole Award For Accidental Brilliance. Please hurry — we need your nominations by the end of this week, Feb. 5.